If practice makes perfect, a group of User Experience Design (UXD) students at Wilfrid Laurier University are on their way to mastering the design sprint process. Laurier Professor Abby Goodrum and eight second-year UXD students led a design sprint for a group of 85 high school students as part of the internationally renowned UXD conference, Fluxible, in late September. The 90-minute design sprint, held at Google’s Kitchener location, introduced high school students enrolled in Specialist High Skills Major (SHSM) courses to the field of user experience design. Design sprints are a key component of user experience design used to foster rapid, user-centred innovation. 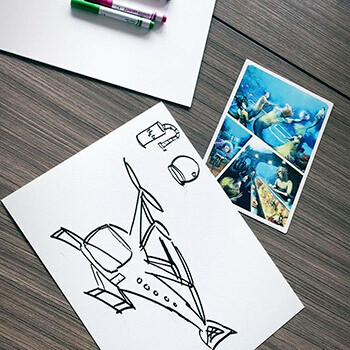 During a sprint, designers ideate, prototype and test solutions to a given problem – anything from how to create engaging experiences online to improving the in-person experience at a theme park. Using the basic tools of design thinking – empathy for the end user, iterative prototyping and testing – design sprints drive user experience designers towards a user-focused solution earlier, avoiding the creation of a product or experience that is not useful for the client. Assisting with executing a design sprint introduced Goodrum’s students to some of their program’s second-year learning expectations. Goodrum and her students used The Extraordinaires Design Studio, a product-design game, to kick-start the sprint. Players leverage design-thinking principles to create a product or experience for one of the game’s many fantastical characters based on their specific set of criteria. The students began the sprint by using information on their character’s card to imagine their hobbies, jobs, likes and dislikes to develop empathy for their character. They were then given a product to design for their character – anything from a building to clothing or mode of transportation – which launched them into brainstorming ideas. Christina Stiller, who recalls playing The Extraordinaires during her first year in Laurier’s UXD program, says contributing ideas during the sprint’s brainstorming phase was difficult for some of the high school students at Fluxible. Stiller and her classmates checked in on the various teams of high school designers to help the ideation process along. About halfway through the sprint, Goodrum threw them a curve, asking the students to incorporate new criteria into their designs. The final product now had to be solar powered, mobile and sustainable for 100 years. Stiller was impressed with how some of the teams adapted to the new criteria. One team of students was tasked with creating a home for a nomadic ninja. They came up with an inflatable shelter, worn as backpack, and made from sustainable materials. Laurier’s Brantford campus welcomed the second cohort of first-year students to the user experience design program this fall. A minor in UXD is now available at Laurier’s Waterloo campus.